an instrument for introducing fluids into or withdrawing them from the body. Components of a syringe. Shading indicates areas that must be kept sterile before and during parenteral injections. From Bolander, 1994. Asepto syringe a syringe designed to fit directly into large lumen tubing; also used for intraoperative irrigation. bulb syringe a syringe with a bulb on one end; compression of the bulb creates a vacuum for gentle suction of small amounts of bodily drainage, such as oral and nasal secretions. It is also used for intraoperative irrigation. Using a bulb syringe. From Lammon et al., 1995.
hypodermic syringe one for introduction of liquids through a hollow needle into subcutaneous tissues. An instrument used for injecting or withdrawing fluids, consisting of a barrel and plunger. /sy·ringe/ (sĭ-rinj´) (sir´inj) an instrument for injecting liquids into or withdrawing them from any vessel or cavity. air syringe , chip syringe a small, fine-nozzled syringe, used to direct an air current into a tooth cavity being excavated, to remove small fragments, or to dry the cavity. dental syringe a small syringe used in operative dentistry, containing an anesthetic solution. Luer's syringe , Luer-Lok syringe a glass syringe for intravenous and hypodermic use. 1. A medical instrument used to inject fluids into the body or draw them from it. a device for withdrawing, injecting, or instilling fluids. A syringe for the injection of medication usually consists of a calibrated glass or plastic cylindric barrel with a close-fitting plunger at one end and a small opening at the other to which the head of a hollow-bore needle is fitted. 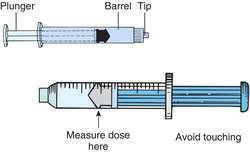 Medication of the desired amount may be pulled up into the barrel by suction as the plunger is withdrawn and injected by pushing the plunger back into the barrel, forcing the liquid out through the needle. A syringe for irrigating a wound or body cavity or for extracting mucus or another body fluid from an orifice or body cavity is usually larger than the kind used for injection. It often has a rubber bulb at one end and a blunt, soft-tipped flexible tube with an opening at the other end. The bulb is squeezed to eject a fluid and is released to withdraw one. Kinds of syringes include Asepto syringe, bulb syringe, hypodermic syringe, Luer-Lok syringe. 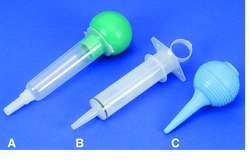 A calibrated disposable plastic–or less commonly, a nondisposable glass tube with a rubber sealed plunger at one end and a tapered tip for the insertion of a needle at the other. See Electronic syringe, SofDraw™ safety syringe. An instrument used for injecting or withdrawing fluids. SYRINGES: A. plastic; B. piston; C. rubber bulb; D. metallic. 2. To wash out or introduce fluid with a syringe. A syringe on a dental unit that delivers compressed air, water, or both through a fine nozzle to clear or dry an area or to evacuate debris from an operative field. Use of high pressure may injure the tissues. A hollow rubber bulb that is fitted to a nozzle and delivers air or fluid when squeezed; commonly called a bulb syringe. A syringe, fitted with a needle, used to administer drugs subdermally. A syringe made of plastic or glass. It is not fitted with a needle but is graduated and is used to dispense liquid medication to children. The tip is constructed to prevent its breaking in the child's mouth. An oral syringe may also be used to deliver fluids to impaired patients with an intact swallowing mechanism. In dentistry, a syringe for delivering water spray to a localized area. The flow, pressure, and temperature are controlled. An instrument, consisting of a barrel and a tight-fitting piston with a connecting rod, used to inject or withdraw fluid. The barrel is usually calibrated in fluid units and the nozzle is shaped to fit a standard range of needles. Luer-lock syringes are designed so that the needle cannot be forced off by high pressure. Most modern syringes are plastic and disposable and are pre-sterilized and supplied in sealed containers. An instrument used to inject or withdraw fluids, consisting of a barrel and plunger. n an apparatus of metal, glass, or plastic material consisting of a nozzle, or needle, barrel, and plunger or rubber bulb; used to inject a liquid into a cavity or under the skin. n a device by which air may be applied to a given area. An instrument supplied as part of the dental unit, consisting of a hand grip, nozzle, pressure-regulating valve, and hose connected to the compressed air supply. n a device that delivers pressurized streams of water and air for use in dental procedures. n a type of hypodermic syringe used in local anesthesia that allows the user to confirm, in advance of delivering the anesthetic agent, that the needle has not entered a blood vessel. 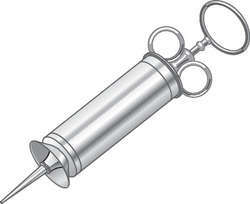 n an aspirating syringe, used to deliver a local anesthetic agent, that is assembled by inserting the rubber stopper end of the anesthetic cartridge first toward the thumb ring, then the diaphragm end toward the needle opening before setting the harpoon and attaching the needle. n a syringe that is usually part of the dental unit through which air, water, or a combination of the two may be delivered under pressure to the desired area. n an air syringe consisting of a metal tube bent at one end, terminating in a reduced diameter, and enlarged at the other end to engage a rubber bulb. The bulb is compressed by hand to supply a controlled spurt of air to a given area. n a needle-free syringe that uses high pressure through small openings (jets) to administer a local anesthetic agent to oral mucosa. n a syringe that does not aspirate before the local anesthetic agent is deposited because it does not contain a harpoon at the end of the piston; this type of syringe should never be used during dental procedures because it is not possible to be certain of the exact location of the needle tip. n an air syringe equipped with an electric heating element to heat the air to any desired temperature. n a device, usually part of the dental unit, permitting controlled application of water to a given area. It has a flow control, pressure regulator, and heating element. a compressible rubber bulb with a pierced, pointed end that allows suction and expulsion of fluids. Useful in irrigating ears or small cavities as in abscesses. an electronically controlled syringe used for delivering small volumes of fluid at a constant rate. one for introduction of liquids through a hollow needle into subcutaneous tissues. a syringe on a long pole so that the syringe can be operated from a distance, e.g. through the bars of a cage.